When Peter Roberts unveiled the prototype of his Concentrique Grand Complication 5 at last year's SalonQP event there was quite a scramble to get a glimpse of the watch, or better still spend time with its maker. This level of hoopla was, in this case well deserved because this was the first time that Peter Roberts had signed his name on a watch dial since his days as a student watchmaker. 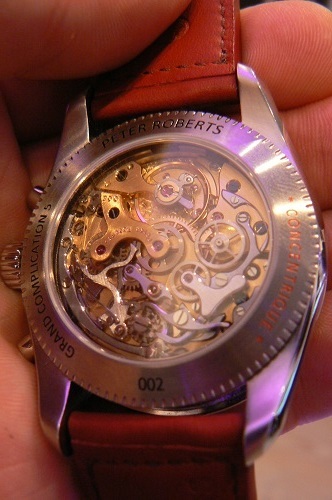 In case you didn't know, Mr. Roberts was the first Englishman to attend the Swiss Watchmaking School, WOSTEP. With his Graduation watch, he achieved a seemingly impossible task - the creation of a five-handed chronograph, previously an example found only in academic text, and it was this watch that he had hoped to recreate and perfect with his Concentrique model. The Concentrique Grand Complication 5 is not simply an emulation of the original, the new piece added a moonphase complication to a dial which even with such a compendium of indications is still highly readable and usable. Functions are hours, minutes, seconds for timekeeping, chronograph with seconds, minutes and hours, a 24 hour GMT with second time zone on the bezel and full calendar with day and month displayed in individual windows and pointer date via a ring positioned just inside the markers. At last year's premier watch event SalonQP, all and sundry were in agreement - the Peter Roberts Concentrique was a fine synopsis of its creator's years spent in the business thus far. Among the current new generation of British watchmakers, Peter Roberts could be described as something of a Horological Godfather. Having spent years in the industry working for both IWC and Rolex in Switzerland, he returned to England where he became a lecturer at London's Hackney School of Watchmaking. There his pupils included Peter Speake-Marin, Stephen Forsey and Meridian's Simon Michlmayr. More recently he helped kick-start Bremont's watchmaking adventure as technical advisor. That he has influenced the resurgence of English Watchmaking is in no doubt and it was entirely appropriate that the first public showing of the Peter Roberts Concentrique Grand Complication 5 took place in the heart of London at the SalonQP event in the Saatchi Gallery. My introduction to the Concentrique "Peter Roberts and the Fine Art of Sticking One's Neck Out". Speake-Marin at Salon QP - Exclusive Live Images.